Dublin's finest park and ride at the superb Clayton Hotel Dublin Airport (formerly Bewley’s Hotel Dublin Airport). Once booked you'll receive a confirmation email which you must take with you on your drop off day. Clayton Hotel Dublin Airport, complimentary courtesy coach operates 24 hours a day, 7 days a week every 15-20 minutes both ways. This will take approx. 5-10 mins. The car park at Clayton Hotel Dublin Airport operates a fully wheelchair accessible service. With ample reduced mobility spaces available on the surface as well as on both underground levels. Reduced Mobility Assistance is available at Dublin Airport to help you going to and from the Coach Park at Zone 14. Electric Car charging station. No traffic, no delays, we are at the M1/M50 junction. Print your tickets at the internet kiosk in the lobby. When you arrive at Clayton Hotel Dublin Airport, take a ticket from the machine and park your car in the car park. Proceed to take the shuttle bus from the designated bus stop area, at front of the hotel. On your return you board the bus from Coach Park at Dublin Airport. It is scheduled every 20-30 mins. 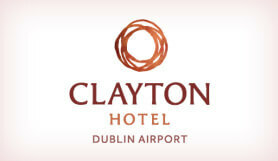 When you return to Clayton Hotel Dublin Airport, you must go to the reception and give your confirmation letter to a staff member and they will validate your ticket. Take M50 / R139 exit. Continue on the M50 following signs for the R139 / Malahide.